Hot off the back of last night's plot thickening and building Game of Thrones season 6, episode 8, “No One”, HBO wasted no time in dropping the trailer for episode 9: “Battle Of The Bastards”. Said preview teases the moment many fans have been salivating for: the showdown in the North between the Stark and Bolton-led armies. This Battle was first glimpsed in the Game of Thrones trailers released before season 6 premiered and it's been all the more eagerly anticipated since that satisfying Jon and Sansa reunion in episode 4: “Book of the Stranger”. Now more tantalizing flashes of the build-up and action itself have been released, and the odds are not looking too favorable for the Starks... not from the outset, anyway. Considering the monumental examples of action, vast depictions of armies, enormous cities and dragon creation Game Of Thrones is known for, "The Battle of the Bastards" will hopefully be a compelling watch too. The new trailer is as notoriously clever with the spoiler avoiding reveals as viewers have come to expect from Game of Thrones, but it does tease some satisfying brutality, giant power and snippets of the accompanying drama -including Jon (Kit Harington) giving his usual brooding valiance in scenes with Sansa (Sophie Turner) and Melisandre (Carice Van Houten). The theme appears to be a bleak one from the opening statement from Jon (“Battles have been won against greater odds”); a panned-out shot of the Bolton forces and Sansa's caution against underestimating the show's current nastiest sociopath Ramsay Bolton (Iwan Rheon) then follow. It is clear here that the Stark forces are outnumbered. The subsequent close-up of Jon, Sansa and Ser Davos Seaworth's (Liam Cunningham) faces mid-battle bring this point home and will leave fans concerned about whose death to inevitably expect - even as hope remains for a Riverrun surplus or Littlefinger (Aidan Gillen) led Eirie intervention of forces, arriving in the nick of time. The few examples of battle sequences the show's budget has allowed for in the past (not to mention the epic battle of Hardhome in season 5) are proof that Game of Thrones can handle this kind of action very successfully. 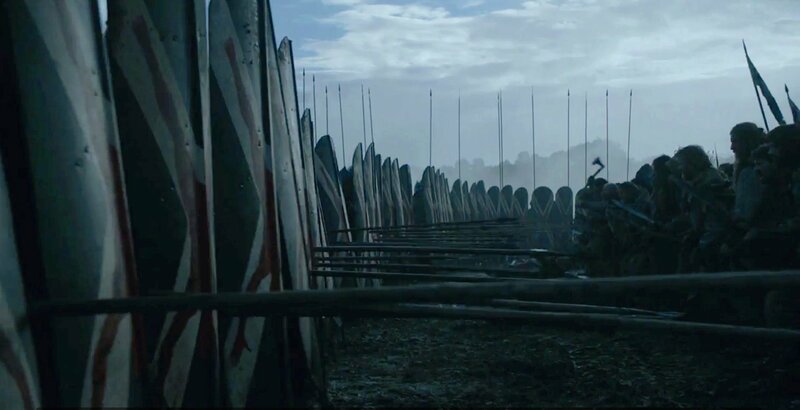 Hopefully, the "Battle of the Bastards" will be a taste of more to come in future seasons, as many of the warring and revenge-seeking factions of characters and their plot-lines come to the boil. Game Of Thrones season 6 continues with "Battle of the Bastards" on June 20th on HBO.